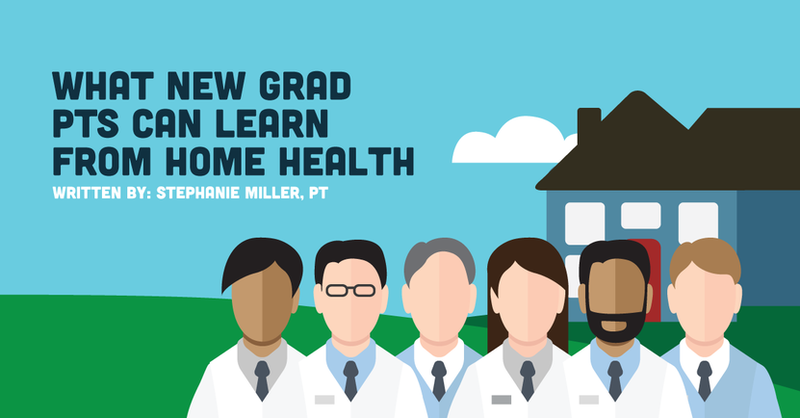 There’s a common myth I’ve heard about home health: It’s no place for new grads. My goal today is to dispel that myth, provide you with some benefits of a home health experience, and hopefully inspire some of you out there to consider this amazing field! Home health needs new grads, and it can benefit you, too. A few months ago, I presented at APTA’s CSM on the New Graduate Mentorship Program my teammates and I developed for the Home Health Section. During the Q&A portion, I was saddened to hear students interested in home health tell stories of professors steering them away from it. They said they were often told that new grads aren’t allowed to practice in home health. If only I could have unheard it all. But I couldn’t. What I could do though was seek out a way to communicate my love of the profession to PT students and new graduates and to welcome them into the field. So here I am. Home health needs new grads! We need your tech savviness. We need your innovative ideas. And we need your spirit! This is the first article in a three-part series. Today I’m sharing some lessons learned after years of practicing but wish I had known before starting my first job. My hope is that this article will pique your interest regarding home health, so article two will provide information on how to prepare you for a job in this area. From there, I hope you’ll be amped up to start looking at home health employers. So, article number three will give you things to consider when deciding between home health agencies to ensure your experience as a new grad is a rewarding one. Lesson 1: Wow! I could’ve done so much better if . . . I definitely fit the mold of that PT student who thought I was destined to be in orthopedics. However, shortly after working in the field, I realized my heart was with the geriatric population. So from there I moved into the skilled nursing setting. Although I was a recent graduate and knew there was always room for improvement, I still thought I did pretty well working in both of those areas. Then I transitioned to working full time in home health. After only a few short weeks, I realized how much better of an orthopedic or SNF therapist I could have been if I had prior home health experience. How many times did I “simulate” home activities, assuming when someone said they had 4 steps and a handrail, that they actually had 4 standard stairs and a sturdy handrail. I never would have assumed the first step was 2 inches taller than the rest and instead of a handrail, it was just a piece of wooden trim a half inch in thickness. Even if you’re not considering a career in it, I would recommend anyone do a student affiliation, shadow, or talk to someone currently working in the field to get a better understanding of how our patients live. You can do the best job of training someone how to use a walker, but if you send them home to an environment where they don’t have the space to use it, how valuable was your effort? Understanding the various structural obstacles of a home is just one of the benefits of home health. Experiencing the impact that family dynamics and financial issues can have on someone’s health and well-being will also open you up to a myriad of questions you may never have thought to ask during your evaluations and treatment sessions. When you work in a facility where the patient comes to you, you don’t always have the opportunity to see what you’re sending them home to. A home health experience opens you up to their world. It can better equip you to think outside the box, ask more meaningful questions during root causes analysis, and develop a treatment plan they’ll actually be able to stick to. Lesson 2: In my house, we . . .
I’ll never forget the first student I had as a home health clinical instructor. She was well prepared, confident, and ready to take on the world! It was her first time performing an assessment on her own and as we were about to get out of the car, I assured her I’d give her the lead but would be there the entire time for support and guidance as needed. She . . . was . . . ready! As we approached the house, the storm door was open and just the screen was between us and our next adventure. She knocked on the door and we heard a faint voice say, “Come on in.” As she opened the door, she stopped dead in her tracks, turned to me, and the color began to leave her face. I said, “What is it? What’s wrong?” She pointed at the ground by her feet and as I looked down, I saw a small mound of dog mess. She whispered, “What do I do?” I could see everything she prepared for slowly drain from her very soul, much as it did for me the first time I had the same experience. I whispered back, “We step over it, follow the voice, meet our patient, evaluate the situation, and proceed from there.” In that moment, she learned a valuable lesson of practicing home health. People don’t always live the way you do. This story isn’t intended to scare you off, as most of the homes I entered were quite lovely. (And to be honest, some of the ones that weren’t ended up being my most rewarding experiences.) It’s only meant to provide you a sense of self-awareness on how your own beliefs and biases may affect your practice. When I took my first home health job, our social worker expressed gratitude for my appreciation of her and her profession, but also explained to me that not everyone I requested her services for actually needed them. She explained that some people are happy living in situations different than what I may prefer, but as long as they’re safe and choosing that situation, we need to be respectful of that. Over time I learned to differentiate between people that needed assistance and those that were living contently. Lesson 3 (and final lesson): You can’t spell home health without TEAM. Communication is not an option in home health. It’s a necessity. Yes, it’s a very autonomous job and you get amazing one on one treatment time that other areas of PT may not afford. Those benefits, however, make it very easy to move throughout the day in your own bubble. But because it is just you and your patient, communicating with your team (nursing, OT, SLP, social work, aides, etc.) is massively important to maintain patient safety and ensure positive patient outcomes. You need to know if his blood pressure was low this morning, his blood sugars were high, his PT/INR was high, or if he forgot to take his medications. Granted technology has improved to where some organizations have real time data to go off of, but nothing, in my opinion, will ever take the place of picking up the phone and updating your teammates if something is out of the norm with one of your patients. You don’t want to walk into a visit missing important information that another team member has and it’s not fair for you to let that happen to your teammates. Before I worked in home health, I thought speech therapists helped people speak (end of story). I never knew speech therapists treated cognitive and swallowing issues. They are completely amazing! I often requested speech therapy referrals for assistance with discharge planning. They worked with patients to ensure they developed a plan for making and tracking physician follow up appointments and for remaining compliant with the programs I created for them. And I could go on forever about the amazing things I didn’t realize OTs could do. His hip is only one part of him. Yes, it’s my priority as the PT to treat the area I’ve been ordered to treat. But it’s also my responsibility to see my whole patient, discuss other services that might benefit him, and then work with the physician to get him the appropriate care. I can only do that if I’m actually aware of all of the great things my teammates can do. If you’re not considering home health . . . Thank you for all that you do. We need amazing therapists in all areas of practice. But I do ask you to think a bit more broadly about what your patient’s life may be like when he walks out of your clinic door. I want you to think about what questions you can ask to make sure he has the capacity to be compliant with the treatment you give him and have the flexibility to change your strategy as needed to accommodate. I also ask that you realize how her comorbidities impact her ability to improve in the area you’re treating. A patient with a knee replacement may also have diabetes. Do you know if she’s compliant with the diet or medication regimen prescribed by her physicians? Can noncompliance with her diabetic regimen affect the healing process? How does activity impact blood glucose levels and do you inquire about her last reading or how controlled her levels have been prior to starting your treatment? Is it important to let her know how uncontrolled diabetes can impact the progress of her knee replacement and potentially your ability to treat her? Never assume someone else has provided your patients this education. I hope you’ll continue to read the next 2 articles in this series and at least pass the information along to your cohorts that may be considering home health! If you are considering home health . . . I hope you’ve found this article helpful and that you look forward to reading the next two. And perhaps most importantly, please know that you are welcome and we’re excited to have you on board!